In May 2015, Trevor started having migraine headaches that we thought were from a concussion and dehydration from playing baseball. He would get these migraines after he was active, so we took him to see his doctor and she said they were most likely from baseball. After a few trips to the emergency room because of the migraines, Trevor started taking medication for the migraines. 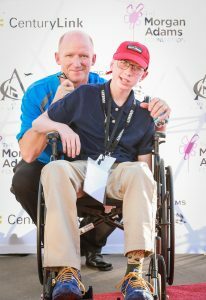 One day in July, Trevor looked at his mom and said that he thought he had forgotten how to chew and that the left side of his body was tingling, so we took him to Children’s Hospital Colorado where they immediately performed an MRI, which revealed the tumor on the right side of his brain. Over the next few weeks, Trevor underwent two brain surgeries performed by Dr. Michael Handler, during which most of the grade III anaplastic astrocytoma tumor was removed. What remained was the part of the tumor that was growing inside of his brain. After the surgeries, Trevor lost about 25% of the use of his right side of his body, which he had to relearn at O.T. and P.T. appointments. He immediately started 34 radiation sessions and several different chemotherapy medications. During all these treatments, Trevor continued to participate in his competitive bowling league and participated in a national tournament in Indianapolis in the summer of 2016. He also practiced with his competitive tournament baseball team during that summer. Trevor returned to 8th grade and only missed one day of school over the course of his numerous radiation and chemotherapy treatments. Trevor was an honor roll student throughout middle school and he also played tuba in the school band. In November 2016, after 15 months of radiation and chemotherapy, we got the word that Trevor was in remission. Trevor began returning to some of his normal activities and was especially happy to be back at it with his competitive baseball team and bowling teammates. In May 2017, while in Grand Junction for the State bowling tournament, Trevor started having seizures and we were told to bring him back to Children’s Hospital Colorado for an MRI the next day. Following the scans, we received the news that Trevor’s cancer had returned. The options for treating his cancer had already been exhausted, but Trevor was committed to helping further the knowledge about his type of cancer and knew it would help other kids someday, so he remained on some experimental medications. 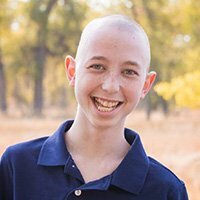 Trevor passed away on October 4, 2017 surrounded by his loving parents and sister.